Available to buy on Leiindias. 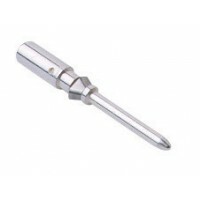 CDMA1.5 MALE SILVER PINS.Heavy Duty Connector Contact.CDMA-1.5 is used with 10A CD series crimp.. Product description Series : 06CCV Product type : 62O Family : 06CSZ Size : 77.27 N. of..
CABLE GLAND: PLASTIC CABLE GLAND M20.. Hoods and HOUSING by ILMEThe ILME CHI-16 C-Type bulkhead mount standard housing is size 77.27 a..